Accommodation at Casa da Lage. 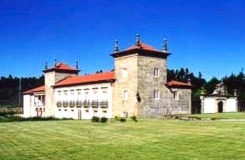 Casa da Lage is one of the large Manor Houses of Portugal in the Lima Valley with accommodation for paying guests. The house has been in the same family since 1468 but then it only had two bedrooms and a kitchen area. In the 17th Century, the owners decided to buy a medieval tower from a property located on the Arga mountain and expand the house considerably. The moving of the tower stone by stone was often interrupted and it was only finished in the 19th century by the grand-parents of the present owner. 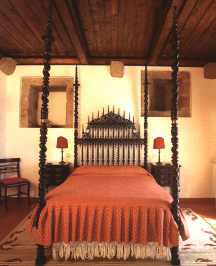 This manor house is tastefully decorated with period Portuguese furniture and traditional hand made ceramics dating from the 18th and 19th centuries. The ceilings of the reception rooms are of wood with a carved coat of arms as the centre piece. Casa da Lage was often visited in the past by European Royal families and still receives the descendants of the Portuguese monarchy. This property is located in a protected area based on the Bertiandos Lagoon and guided walks can be arranged. It is in the foothills of Serra d'Arga where wild horses still roam and also near to the Lima river which is one of the few in Europe where the waters are clean enough for the lamprey to spawn. The historical town of Ponte de Lima is 3 miles up river which has a rich architectural heritage, an ancient market, village festivals and good restaurants. The guest accommodation at the house has the whole of the ground floor with the owners living in the first floor. There are 3 double bedrooms and a twin bedded room which has a sofa bed for one adult or child. All rooms have an en-suite bathroom, TV and mini bar. Three of the bedrooms have doors leading to a covered terrace overlooking the estate vineyards and the lawns, where breakfast can be served. 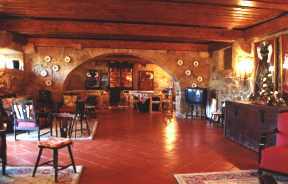 The quinta wine cellar has been superbly converted into a guests living area with games room, television area with sofas, pool table, etc. "I stayed at Casa da Lage. Rightly called one of the ‘noble houses of Portugal’, it is set in luxuriant countryside. Dating from the 14th century, it possesses both antiquity and beauty. The house exemplifies gracious living. The grounds are lush and extensive, the vineyards flourishing. This is a good walking area with inviting paths to follow. Golfers travelling in small groups find Casa da Lage ideal. In the manor house itself, there are three double bedrooms and a twin bedroom. Casa Tulha, a well-equipped guest cottage contains six twin bedrooms, some of which have extra sofa beds. There are kitchen facilities, a large living room and a fireplace. In total, more than 20 can enjoy calling Casa da Lage home while playing golf at Ponte de Lima. 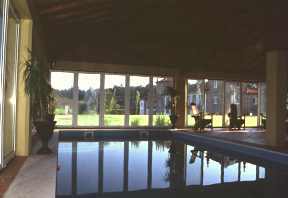 Facilities for guests of both manor house and cottage include an indoor swimming pool and large lounge. Several restaurants are nearby. Outstanding among them is ‘Carvalheira’, which does excellent steaks in a variety of ways. A bountiful array of appetisers are delicious. Informal in style, a smart/casual ambience prevails."